Picnic for 4 Set Includes: 4 Acrylic wine glasses, 4 Plates, 4 Forks/knives/spoons, 4 Plaid cotton napkins, Stainless steel salt/pepper, Corkscrew with wine/beer opener, Cheese knife, Bamboo cutting board, Water resistant backed fleece blanket. Everything you need to enjoy the summer sun all in one place with this perfect picnic bag for four. 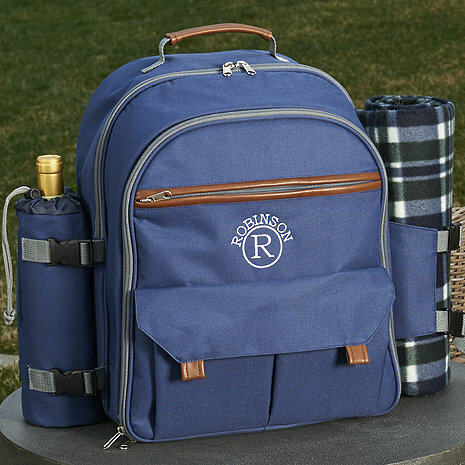 Ideal for hiking, biking or taking to an outdoor concert, our backpack has it all: a large insulated food compartment plus plates, flatware, stemware, cotton napkins, corkscrew, bamboo cheese-board, cheese-knife, stainless steel S & P shakers, an insulated detachable wine bottle sleeve and of course a cozy plaid blanket to sit on or cuddle up with. Constructed from heavy duty 600D canvas in navy blue with leather trim. Available with or without personalization. Looks great but...Seams inside opened needed to be repaired after just one use. Design flaw? A must for any picnic-goer! Love, love, love it! I’ll be so proud to take this on my next picnic.